Viral pneumonia is common and can be easily transmitted. You must know the symptoms and how they spread. Get treatments and prevention here. Pneumonia refers to infection of the lower respiratory tract that can be caused by pathogens like viruses, bacteria, or fungi. Viral pneumonia is caused by viral agents that are spread via nose and throat to involve lungs and lower respiratory tract and may result in long term sickness. It is estimated that more than 30% pneumonias are viral in the U.S. The symptoms start from running nose and sore throat for 2 to 3 days and followed by more serious infection of lungs. The pathophysiology involves accumulation of inflammatory fluid in the air spaces of lungs (comprise of WBCs, debris and fluid) to clog or block air- passages. Concomitantly, individuals suffering from viral pneumonia complain of breathing difficulty and congestion of chest. Influenza/flu. The type A and B flu viruses are known to be the most common cause of viral pneumonia in adults. In infants, the most common cause of this viral disease is RSV (also known as Respiratory Syncytial Virus). The other prominent causes of viral pneumonia include coronavirus, parainfluenza virus, adenovirus, and rhinovirus. These pathogens cause viral pneumonia as well as other symptoms such as pinkeye. In rare cases, viral pneumonia could be caused by measles, herpes simplex, and chickenpox. The severity and the duration of contagiousness depend on the cause of pneumonia and the treatment that is being provided. Depending on the quality of care, the symptoms may resolve in few days or up to several weeks. The first stage of viral pneumonia is marked by running nose, sore throat and coughing. These symptoms are not severe in the beginning but may lead to serious issues later on. The primary symptoms of viral pneumonia include mild or high-grade fever, body shaking and shortness of breath. Shortness of breath is not reported in every case and is often experienced with exertion only. 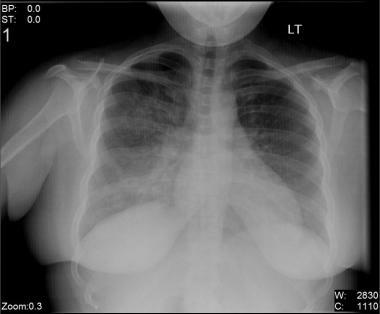 When children (under 2 years of age) are developing signs of pneumonia. When people over the age of 65 develop the signs and symptoms of pneumonia. People with weak immune system and existing serious health issues. People going through a medical procedure especially chemotherapy; or those who are taking medications that weaken the immune system in any way. It can dangerously damage health and can even cause life threatening problems to individuals with heart failure or lung disease. In case of influenza virus, doctors suggest medication like Tamiflu and Relenza. These agents help in preventing the spread of viral pathogens. In case of RSV induced viral pneumonia, your doctor may suggest medications including Virazone. It also helps in limiting the virus from spreading or involving other parts of your body. Doctors always suggest long bed rest and tests after the treatment to assure that the functional status of lungs is restored without any residual complications. Try to control your fever: You can use aspirin, acetaminophen and nonsteroidal anti-inflammatory drugs or NSAIDs such as ibuprofen and naproxen. The severity of the disease must be checked before taking these medications. It is imperative to mention that aspirin should not be given to the children. Consult your doctor first if you are about to take cough medicine because sometimes these agents make it even more difficult for you to cough up the sputum. Try consuming as much fluids as you can to loosen the respiratory secretions. In addition, these agents also help in boosting your energy levels for speedy recovery. How Does Viral Pneumonia Spread? Sneezing and coughing: Germs are transmitted air in the form of tiny droplets which are inhaled by other individuals with breathing. Touching objects and transferring germs through those objects: Viral pneumonia is also spread via objects that are contaminated with germs. For example, germs get stuck on the hands of person who touch the object and are then transferred into the respiratory tract to cause the infection. Vaccination: The vaccines are helpful in preventing the pneumonia and flu like ailments. Speak to your doctor regarding different vaccinations. There are special vaccines available for the prevention of viral pneumonia in children between 2 and 5 years of age. Flu shots are also suggested by the doctors for children of age over 6 months. Good hygiene: You must follow good hygiene to keep yourself away from pneumonia. Quit smoking: The primary cause of damaged and vulnerable lungs is smoking; quit smoking and stay away from second-hand smoke as well. Strong immunity: Strong immune system is helpful in wardingoff infectious agents. It is highly recommended to maintain a functional lifestyle by maintaining enough sleep, eating healthy food, and following a regular exercise plan.